New York has been the centre of North American waterborne activity since it was founded as Nieuw Amsterdam in the 17th century. The Hudson River was the Pilgrim Fathers’ planned destination (they never made it). Ellis Island is synonymous with European seaborne refugees from 1892 until 1954. And the Hudson River was the world’s busiest passenger port in the period between the end of the First World War until the arrival of the Boeing 747 in the early 1970s. Today New York as a port, or more accurately its approach via The Narrows, is making a serious comeback after years of decline. Our ship report this month is a preview, Quantum of the Seas, 167,000 gross tonnes and 4,000 passengers, which from November 2014 to be based at Port Liberty, in Bayonne, New Jersey. With her arrival the world’s three largest cruise operators, will each vie for business with giant liners out of New York, the majority seven-night cruises to Bermuda. Royal Caribbean (RCCL) with Quantum, Norwegian and Breakaway, plus Carnival whose Queen Mary 2 is a regular visitor and is still on the North Atlantic beat from time to time. All these companies, and many other cruise lines too, offer a vast selection of trips; to Canada, south along the US eastern coast and the Caribbean, and also into the Atlantic and Europe. If you are thinking of a cruise holiday out of New York not only is there as choice of ships and operators, but there is a choice of embarkation points too. Whilst strictly not New York (but part of the Port Authority, with easy access to Newark Airport) The Cape Liberty Cruise Port, sometimes called Port Liberty, is in Bayonne, New Jersey. Operational since 2004 it is the base for Royal Caribbean, Celebrity and Azamara. On a good day it is 40 minutes from Times Square by taxi. Newark-Liberty airport is 10 miles away, 20 minutes maximum. Brooklyn Cruise Terminal is a very basic utility operation but works well. It is the home of the Carnival Group (Carnival, Cunard, Holland America, P&O and Princess) in New York although their ships also use the Hudson River berths. JFK is the nearest airport (15 miles and 30 minutes) whilst Times Square is only seven miles (15 minutes) although traffic over and under the East River can be heavy. For domestic air travel (and Canada) LaGuardia is only 12 miles distant. The Manhattan Cruise Terminal is used by Norwegian Cruise Lines for its weekly Getaway departures to Bermuda, and the Caribbean in the winter. The rejuvenated terminal consists of Piers 88, 90, 92 and 94 on the Hudson River between West 46th and West 54th Street. Pier 86, once the base of United States Lines, is now home to the USS Intrepid. 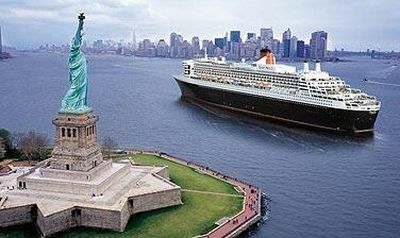 New York is a great place to start or finish your cruise holiday. It is one of the most accessible points on earth too. Quantum of the Seas, the first of three 167,800-gross tonnes, 4,180-passenger next generation Royal Caribbean cruise ships to debut, will launch November 2014 with 2,090 cabins including 373 virtual balconies – inside cabins featuring real-time views of the ocean and destinations. 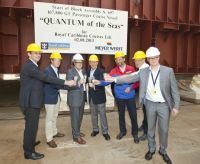 Its sister ship in the Quantum class, Anthem of the Seas, will sail spring 2015 and the third ship will debut in mid-2016. She will be based in New York. Maybe RCCL overdid it with the extraordinary Oasis-class ships, which measure 225,282 tons and carry 5,400 passengers at double occupancy (6,000 with children). At 167,800 tonnes, the new-builds are similar in tonnage to the companies 154,000 Freedom-class trio which debuted in 2006 but carry 400 more passengers bringing the total up to 4,160. Quantum of the Seas includes a skydiving simulator and North Star, a jewel-shaped glass capsule rising 300ft above sea level and providing 360-degree views over the sides of the ship. Seaplex will become the largest sports and entertainment complex at sea, with attractions including bumper cars, roller skating, and a circus school complete with a flying trapeze. The adults-only solarium and outdoor pool will return featuring a brand-new indoor pool with opening roof, ideal for the Mediterranean in the winter. Of 2,090 cabins, 1,570 will be balcony, 147 outside (window view), 373 virtual balconies (inside), and 34 cabins will be wheelchair accessible. Royal Caribbean says that they will be 9% larger, on average, than those of the Oasis-class ships. USB outlets are being provided. Family-connected cabins will offer flexibility for multi-generational families, connecting three different cabin categories to create a layout which provides separate bedrooms and bathrooms for each occupant. A small number of Studio staterooms (single occupancy) are being provided including some with balconies. Crystal Cruises is planning a magical winter wonderland holiday with a new Antarctica Christmas/New Year cruise. In addition to three days sailing Antarctic waters, the 21 December 2013 Buenos Aires – Valparaíso voyage onboard the Crystal Symphony sails through Argentina, Uruguay, Chile, the Falkland Islands, Drake Passage, Cape Horn and the Chilean Fjords, with multiple excursions to the Antarctic continent. Crystal is one of the few cruise lines permitted to sail to Antarctica, due to the strict environmental regulations, for which Crystal has incurred extra cost and planning efforts. “We are always very environmentally conscious of the destinations we visit”, says Philip Ordever, Crystal’s Vice President of International Sales & Marketing. “We’re thrilled to be able to meet the new standards required to bring guests to this spectacular region this year. Oceania is to go global for the first time announcing “Around the World in 180 Days” port-intensive 180-day voyage the 684-guest Insignia, setting sail round-trip from Miami on 10 January 2015. This cruise visits five continents, 44 countries and 89 ports of call and will feature 11 overnight calls plus four two-night calls in Cape Town (South Africa); Yangon (Myanmar/Burma); Singapore (Singapore); and Shanghai (China).